4. Lower the hard drive cdaddy retaining latch until it snaps closed. - Fast & Reliable connection just as the primary HDD. - Fully integrated into Laptop, no cables / PSU / software driver needed. - The metal portion of the caddy is manufactured in lightweight die-cast aluminum to help dissipate heat from the drive and to reduce EMI noise. If you can&apos;t confirm your laptop model, please feel free to contact us. p/s: SSD/HDD (hard disk) not included. What is this flip switch on the hdd caddy? - mostly no need to do it. some special notebook, if can&apos;t find hdd in the bios or system, can change this button. HDD Caddy is a case for a hard drive which you can mount inside your laptop. This case fits perfectly in the bay where normally your optical drive (dvd-drive) is located. 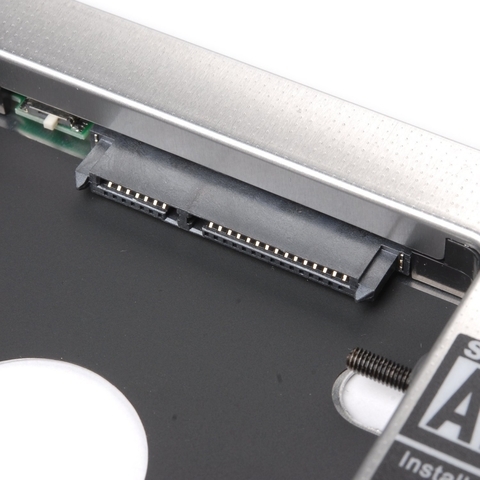 This allows you to exchange your optical drive with the HDD Caddy. The second hard drive in the HDD Caddy that is now inside your laptop will be, for instance in Windows, immediately recognized as a second storage disk. You can use the second storage disk to store your files, music, movies, programs, and games. In most laptops you can set up the second hard drive to boot a second operating system. For instance if you want to use Linux besides your Windows installation. HDD Caddy is an easy way to increase the storage capacity of your laptop. Nowadays the use of SSD has become more popular. A SSD is a very fast “hard drive” (technically it uses chips instead of disks) which can replace your old HDD to increase the performance of your laptop. It is often economically better to upgrade with SSD than to buy a new laptop. However SSD is relatively expensive and storage capacity is limited. HDD Caddy is therefore a great solution to solve this problem. 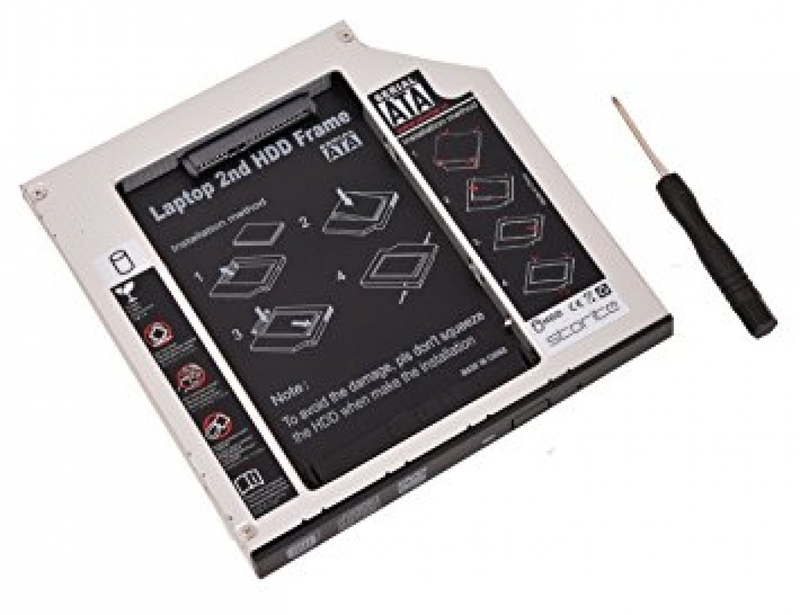 You can put the original HDD inside the HDD Caddy and install the very fast SSD on the primary bay of your laptop where you will install the operating system. With this setup you can enjoy better performance thanks to the SSD upgrade and have the flexibility of large storage capacity thanks to the HDD Caddy. The installation of the HDD Caddy can be done in ten minutes. You can often remove the dvd-drive by taking out a screw at the bottom of your laptop. When the screw is removed you can take out the dvd-drive and replace it with HDD Caddy and a second hard drive. Then put the screw back in. We will update the laptop model from time to time. You can search for your laptop model by CRT+F. If you cannot find your laptop model, you may google or contact us. The Universal 9.5mm SATA-to-SATA Caddy is compatible with laptops that has a 9.5mm-thick / high optical bay with the SATA interface. Apple MacBook Pro 2010 15"
It doesn&apos;t fit non-unibody models. It does not fit early 2011 Macbook Pro 13"
will this work with the late 2013 macbook pro? - No, the Retina Display models do not contain the optical drive and as such lack the ability for this caddy to be installed. 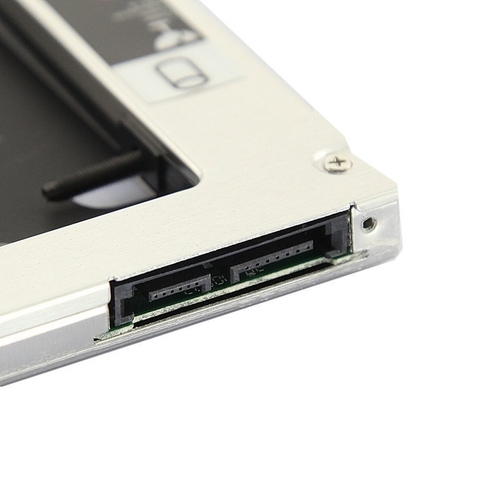 The Universal 12.7mm SATA-to-SATA Caddy is compatible with laptops that has a 12.7mm-thick / high optical bay with the SATA interface. The Universal SATA-to-SATA Caddy is compatible with laptops that has a 12.7mm-thick / height optical bay with a SATA interface. AD-7640S DS8A5SH DS8A8SH .etc DVD BR Burner drive. GSA-GT30L,GSA-T30N,GSA-T30L,GSA-T50N,GSA-T50L, TS-L633, GSA-GT20L UJ-875A,AD-7640S etc DVD Burner drive. For more laptop model which if you can&apos;t confirm your caddy size, please feel free to contact us. We dont&apos; have this caddy.